I don’t want to run out. Anyone see “Conspiracy Theory” with Mel Gibson? The original manufacturer of moleskine type notebooks quit production in the 1980s, and British novelist Bruce Chatwin famously bought out everyone he could find in the stationary shops of Paris. An Italian company started making them in 1996, and they began delivery to the US in 1999. I must have discovered these gems shortly thereafter, in a Barnes & Noble bookstore in Fort Worth. which suits my needs for jotting quick notes. My schooling and work experience as an engineer has made me prefer quad paper. 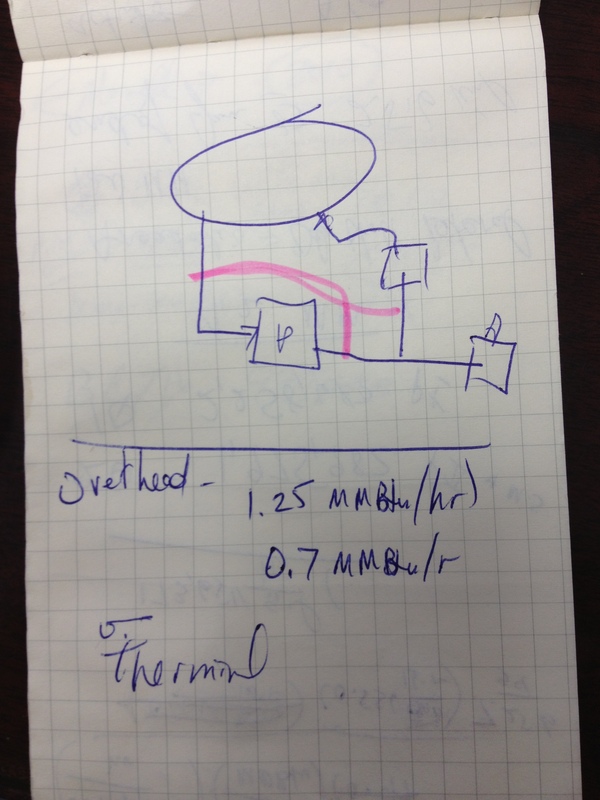 All of the notebooks have acid free paper, although I can’t see that my scribblings need preserving for the ages! They also normally have detachable pages in the back and a small pocket, which I find handy for storing a few business cards. I keep one in my purse or briefcase at all times, and use them for making work notes, jotting down phone numbers, serial numbers, flight details, meeting minutes, and sketching out ideas. Each page is a complete mess, as it’s my train of thought I’m recording and not something I need to keep forever. 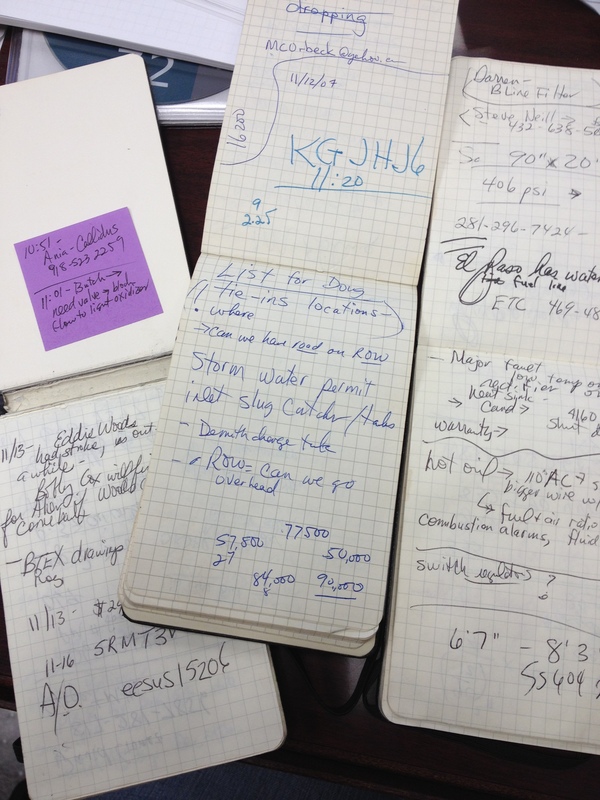 However, I am familiar enough with my style that I can often go back to an old notebook (I keep them in a draw as I fill them), and find a particular phone number or some note I made about equipment I ordered two years ago. 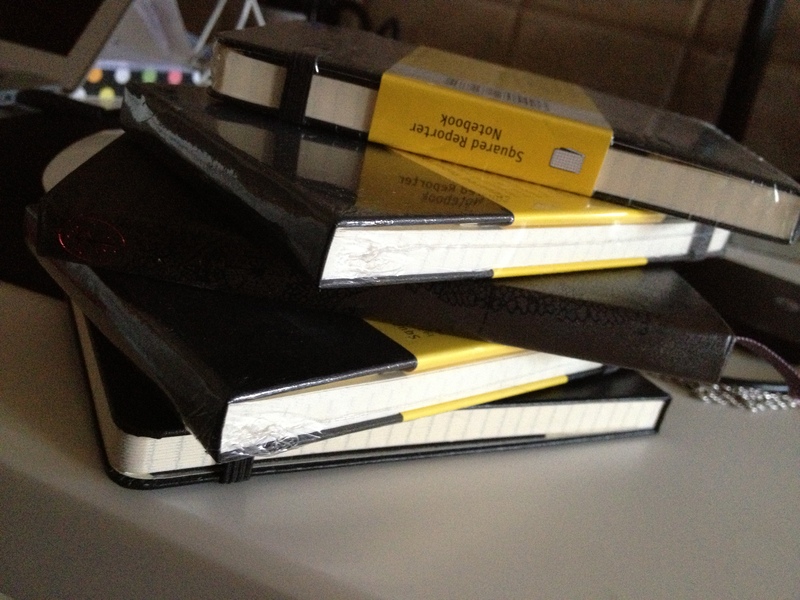 Occasionally I panic that the company will quit making the notebooks, so I keep a stash. Moleskine now makes all sorts of special edition books, wine journals, diaries, city guides, books with lined music staffs. I stick to my simple quad paper, although I did succumb to the J. R. R. Tolkien special edition that I found on thinkgeek.com. 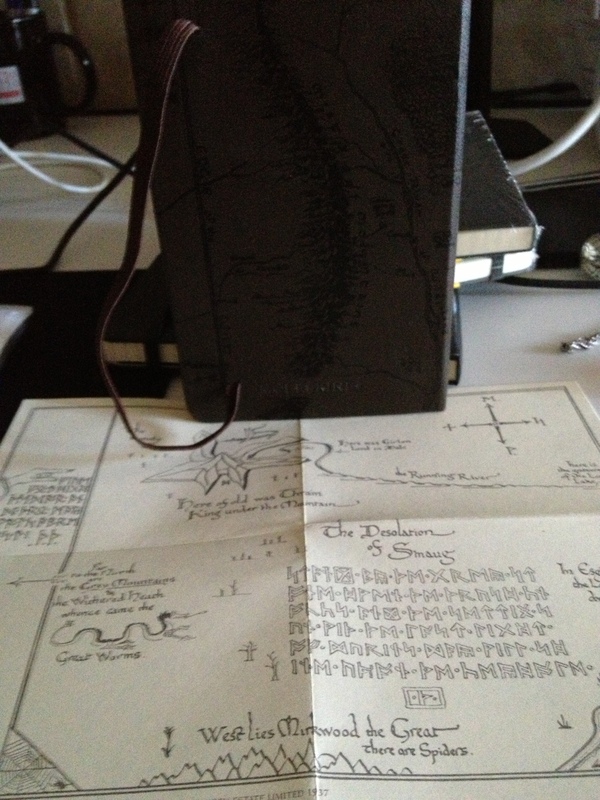 It comes with a map of Middle Earth: I’d hate to wander AND be lost. 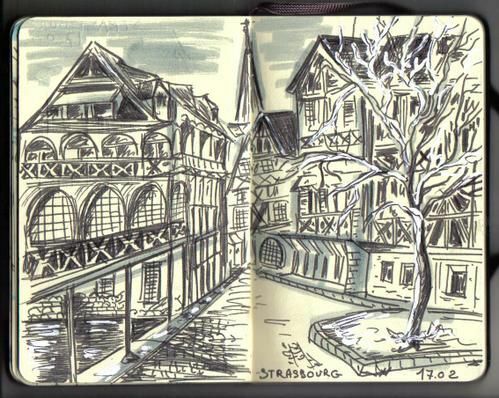 When I was doing some research for this article, I ran across a treasure trove of beautiful work that artists have been capturing on their Moleskine notebooks. I admit it makes me a bit envious of their talent. 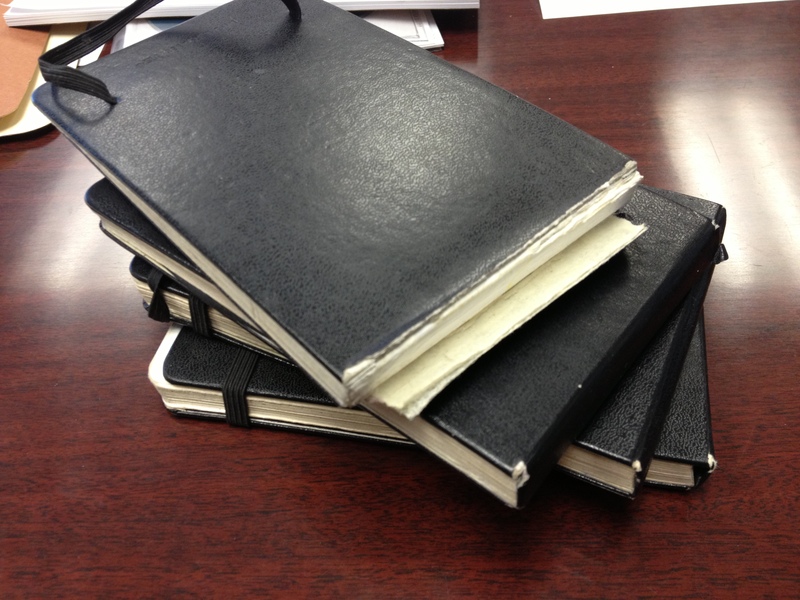 I have none, but my notebooks are a tool, not a creative outlet. The Moleskine notebook became so popular that the Italian company could not keep up, and expanded manufacturing to several countries. Now, not only do they offer the traditional note book in standard and pocket sizes, they come in white and other colors, in packages of thin ‘day journals’ that have a few dozen pages, easy for carrying, and just out, black pages. This is a flashback cue to a few years ago, when school notebooks had black pages and all the teeny-boppers carried handfuls of pastel and glittery pens. There are other brands of notebooks, and some of them may be better, but I find these useful, widely available, and handy. The tool meets my needs, so I don’t need to look further. My own artwork consists of quick sketches to demonstrate a technical issue, but I wanted to leave you with some of the beautiful artwork I found when doing a Google search for how other people use their notebooks. I’ve been to Alpine Texas many times. It doesn’t look anything like this.